The Indian flavors in this soup are really subtle, so if you're not a big fan or if you're not familiar with Indian cooking, give it a try anyway. 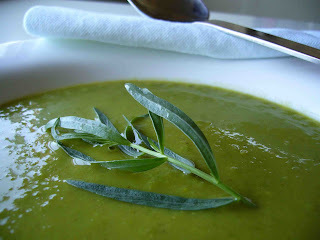 It's a nice variation on the usual pea soup. Heat oil in a large saucepan. Add onion and cook until starting to turn translucent, about five minutes. Add garlic, ginger and curry to the onions and cook, stirring regularly, for about five more minutes. Add peas and cook until warmed through. Add veggie stock and bring to a simmer. Simmer mixture for about 10 minutes and then remove from heat. Cool slightly before using an immersion blender to puree the mixture. Garnish with a sprig of tarragon before serving and enjoy! This looks really good--I love peas abd curry!